Your VTR, TRA, or AMGBA Dues! The Roadster Factory Free British Car Event Listing Page. TRF has been a strong supporter of British car club events ever since Charles Runyan founded the company in 1978. We have attended hundreds of events over the years. If you or your club would like to list an event, please click on the link below. Send us your 2019 Event information! Note: We have attempted to identify inaccuracies of the email or Website links given below. If you or your club has an event listing here, please check the links for yourself; if there are errors, please contact Karen Border, TRF Publications Director, so that we may make any necessary changes. Wheels Across The Pond is one of the premier British Classic Car and Motorcycle Shows in the state of Florida taking place on Easter Saturday each year at the beautiful Carlin Park in Jupiter. Since our first show in 2007, we have continued to grow to where now we can expect more than 250 British and European Classics every year. Wheels Across The Pond is free to spectator admission and our show raises money each year a Jupiter-based no-kill animal rescue center, the Busch Wildlife Sanctuary. Very nice show. Primarily British but other overseas marks also. Good way to spend an afternoon enjoying British cars and the Florida sun. This annual event is Southern Ontario’s largest British car parts flea market featuring both used and new parts for all types of British cars. You will also find books, clothing, regalia, car club information and much more.Last years’ show featured over 325 British Cars, some older than 75 years old. EVENTS INCLUDE: The Convention will include Concours’ and Participant’s Choice Car shows, driving events like autocross, rallies, hill climb, Funkhana, Gimmick Rallye and casual drives. The route is entirely on public, paved roads, no off-roading. The event is suitable for all vehicles and driver skill levels. It is a laid back and casual “gimmick rallye” where the challenge is to spot and record the answers to questions based on signs and objects found along the way while following turn-by-turn route driving instructions, devilishly laid out by the Rallyemaster, whose job it is to make you laugh as you attempt to find the answers to the rather silly questions, riddles, and trivia. Setup from 7:00 a.m. to 9:00 a.m. Sales from 9:00 a.m. to 2:00 p.m.
Everything cleared out by 3:00 p.m.
British sports cars, motorcycles, and other vehicles. Featured Marque: Austin Healey 3000. BENEFITS: We ask that each participant at Britfest 2019 bring an item of non-perishable food to donate to the Interfaith Food Pantry of Morris County. Please select an item from the Current Needs List found at their website, www.mcifp.org. Only original British vehicles. Replicas, kits or reproductions will not be accepted. http://www.kaskastner.com/kastnercup.html (official Kas Kastner website to learn more about the Kastner Cup). VARA British Extravaganza features British Marque races and a British car show. All Kastner Cup entrants will be entered to run with regular VARA run groups including the Union Jack Challenge (all British car) race—MG, Mini, Sprite, and Triumph Challenge Races, Pre-War/Historic Run Group. BENEFITS: Rotary Literacy and Education Projects for Local Youth, Children and Schools. British Motor Cars of New England's 8th Annual Spring British Motoring Tour (AKA: Rick's Ride) along the back roads of the Massachusetts South Coast and Rhode Island East Bay region will be held this year on Saturday, May 4, 2019! REGISTRATION: There is NO CHARGE to join us for the group drive. Remember that we're just a group of friends out for a drive, and by joining with us, you assume responsibility for your own actions. Come join us for a memorial road tour from The Roadster Factory parking lot to the Horseshoe Curve. Start time is 9:00 a.m.
European automobiles and motorcycles welcome. Join us in the shadow of the Great Smoky Mountains, as people from all over the southeast and beyond come together to show off their colorful paint, polished chrome and works in progress. Relax in the beauty of a Smoky Mountain spring. Come a day early or stay a day late and drive the Cades Cove loop, hike Laurel Falls, visit Sugarlands Visitor Center or wade in the Little River. OR, drive the newly completed Foothills Parkway, now offering 33 miles with some fantastic views. The host hotel, the Holiday Inn Express, 254-947-4004 is already booked for the TMGR rate, but the Day’s Inn is available, 607-972-9252 before April 16th. Friday: scenic drive to Georgetown, Texas. Pizza party in the evening with DJ at the Holiday Inn parking lot. Yes, dancing under the stars will be encouraged. Saturday morning: Car show followed by lunch at Pace Park. Saturday afternoon: Funkhana Saturday evening: Happy hour, dinner and awards at The Barn near Pace Park. Three day event. The Carlisle Import & Performance Nationals welcomes the world of cars transcending all marques, scenes and styles of Import and Performance vehicles. This exciting event welcomes Imported vehicles from around the world as well as domestics, kit cars, motorcycles and trucks and high end performance vehicles. See the top builds, restorations, clubs and brands representing the world of automobiles and performance. Come join us for a day of family fun. More than 125 cars representing over 60 years of British motoring history. Regalia for sale, raffle prizes, a 50/50 drawing, and a Hot Wheels race for the children. Early registrants are entered in a drawing for a $100 gift card. Early registration ends April 12, 2019. A time set aside nationwide as a recognition of classic British cars. Get your car out and drive it! This special extended awareness week is a calling for all British car owners to get their machines out of the garage and onto the roads and byways throughout their little corner of the world, and give these timely classics of the past the exposure they deserve. While not only heightening the awareness of these somewhat forgotten vehicles of the past, they will help assure their preservation for many years to come for future enthusiasts to cherish. Meet and greet Friday evening, a Saturday rallly and banquet, a Sunday breakfast run, and the great show on Sunday from 9:00-3:00. Burt “B.S.” Levy, author of The Last Open Road and other novels will be our honorary chairman and speaker at the evening banquet. Join us for an all British Marque, judged, car and motorcycle show, and a nationally sanctioned Jaguar Concours at historic Hope Lodge. Also beer tasting from craft breweries, and kid friendly activities. BENEFITS: the Daily Bread Homeless Kitchen and other charities. Our 10th anniversary and we're up to 650 cars and motorcycles, that’s just for starters! We have also Antique Airstream trailers, farming hit and miss machinery, Steam, WW2 military airplanes, glider, hot air balloon, and helicopter flights for the public. Last year we had 17,000 in attendance. Come and join us. BENEFITS: All proceeds go to The Boys Republic School. The British Bash is the Louisville British Sports Car Club's annual British car show featuring the regions’ finest and most interesting cars. Held on a large, shaded lawn, there are typically 34 classes each year with awards going deep so there’s a spot for all British marques and models regardless of condition. There is even a "Diamond in the Rough" class! (please have your tetanus shots updated). The show field opens at 9am with popular voting by the entrants starting at noon. Awards are scheduled for soon after 4pm. For those coming in from out-of-town, we have a host hotel with a discount on a block of rooms. There will be plenty of friendly people, good music, great food, LOTS of awards and prizes… but most of all FUN! FEATURED MARQUE: 60th Anniversary of the CLASSIC MINI produced from 1959-2000. The event highlights are: Reserved Tours in the Area, Live Entertainment, Classic Car Show, Funkanna, Tech. Session, Awards Banquet & Ceremony and much more! Saturday's events include the Grand Ascent, a VSCCA sanctioned hill climb exhibition in the European tradition, where drivers will pilot some of the finest vintage race cars up the historic back road to The Hotel Hershey. Also on Saturday is a Cars & Coffee event. SCHEDULE	Friday: Evening cocktail party. Saturday: Cars & Coffee. Timed "Elegance Challenge" race in morning. Vintage hill climb exhibitions on the historic back road to The Hotel Hershey, 9 a.m.-4 p.m. Dinner party and charity auction in evening. Sunday: "The Elegance" concours car show on grounds of The Hotel Hershey. Friday: Time-Speed-Distance Rallye, through beautiful mountain scenery to Glenwood Springs. Saturday: a more relaxed Tour, with a fun murder-mystery twist. Popular vote show for all British cars and motorcycles. BENEFITS: local charities. For the last two years, our Club has donated $1500 to local charities. Registration starts at 8 AM. BENEFITS: British Field day raises money to support the Salt Lake Arts Academy and the Liberty Wells Community Council. All British Cars, Trucks, Motorcycles and Tractors welcome from works in progress to super cars. Kids Garage coloring contest & British car scavenger hunt, and kids can even take a ride in a classic British car. ACTIVITIES: informal motel parking lot “tire kickers”, a Friday evening social gathering, Saturday evening wind up meal, informal pie runs and another Morris Calvert Memorial Rally (poker run). REGISTRATION: Pre-registration is $25 per car. Limited to 250 cars. Registration on day of event (space allowing) is $35 per car. Only pre-registered cars will be judged. It is mandatory that each vehicle have a fully charged fire extinguisher. English cars and bikes welcome. REGISTRATION: Individual Car fee is $100. (Registration at the door will be $125). Low key rally/drive (not a TSD rally) from Hartford CT to Thompson Speedway in Thompson CT. Some parade laps included. Breakfast and Lunch included for driver & navigator. All vehicles welcome. Attendees can also stay entertained with two separate car shows, the British Car Showdown, happening on Saturday, and the Concours d'Elegance on Sunday’s schedule. Attendees wanting to participate in the car shows can sign up during the morning on site and will be able to take a lap around the Mid-Ohio Sports Car Course during the lunch break in their classic car as part of their entry into either show. Show entry is free with a paid general admission to the Vintage Grand Prix of Mid-Ohio. Join the St. Louis MG-T and MGB clubs at this annual Event for the Central States to promote a good time and the preserving of the MG Car with Tech Sessions, Road Ralley, Car Show, good time and good food. GOF Central is the premiere yearly MG event in the Midwest drawing well over one hundred of the most beautiful MGs in the country! GOF Central is sponsored by a loose coalition of independent MG clubs and state chapters of the New England MG-T Register located in the central United States. The featured marque is the MGB Chrome Bumper. BENEFITS: Bring a can of food for our “Help Michiana Brits Drive Out Hunger” donation to the Food Bank of Northern Indiana. July 13th, Saturday from 3:00 p.m. to 8:00 p.m.
BATTLE OF THE BRITISH CAR SHOW! See who in DFW ends up with the Bragging Rights – the Triumphs or the MGs. 1806 W. Belt Line Rd. Make checks payable to “Cedar Hill Chamber of Commerce”. Registration and Parking Available at 2:00 p.m. and Awards at 7:00 p.m.
KICK-OFF RALLYE: Sunday, July 7 – 10:00 am – 5:00 pm. HOSTED BY: Greater Pittsburgh MG Club and Western PA Triumph Association. Saturday: Vintage race practice and qualify heats, 9 a.m. to 5 p.m.
Sunday: Featured races, 10:30 a.m. to 5 p.m.
BENEFITS: High Hopes Foundation of NH & the New Hampshire Food Bank. Corner of SR 91 and Chapel St. REGISTRATION: On or before July 19th: $15 first entry, $10 each additional entry. Show registration and car cleanup 9:00 am to noon. Only British cars please. Limited to 25-30 cars. The first 5 of each make will be accepted so we can ensure a variety of makes. You will receive a confirmation under separate cover to let you know the status of your registration. Owners may start parking cars at 8:00am on 22nd Ave, Edgewater, on the south side of the park. The street is not a through street and will be blocked to traffic. The car show starts at 9:00 am. Coffee and doughnuts will be provided in the morning. Two coupons for beer will be included for approved registrations. ACTIVITIES: Participants choice car show, vendors & swap meet, full service concession stand, dash plaques to first 300 entrants, and as always, spectators are admitted for free. HOSTED BY:	Lanco MG Club, Inc.
Polo match starts at 2:30 p.m. for "Taste of Britain Cup." HOSTED BY: Central PA British Car Club, Inc. REGISTRATION: $20 before August 3, $25 after August 3, 2019. HOSTED BY: Aristocrat Motors, Kansas City MG Car Club, KC Triumph Car Club, Heart of America Jaguar Club, and hosted by the Heartland All British Car & Cycle Meet Committee. REGISTRATION: $35.00 per entry. Includes Car show and/or Journey to the top Rallye. Does not include the price of your meal at the restaurant. Join the Stonebridge Drivers for a Triumph only car show, including a special competition between participating Triumph Clubs. This event also includes a scenic Rallye/Tour called the Journey to the Top which culminates at the Top of the Lake Restaurant. 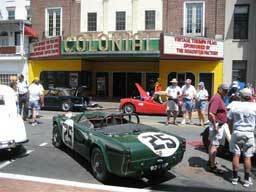 This Triumph-only event kicks off four days of vintage car fun in Watkins Glen. SUPPORTERS: Officially supported by the following: British Iron Touring Club of Northwest Arkansas, British Motoring Club of Arkansas, Greater Ozarks British Motoring Club, Jaguar Club of Tulsa, Inc.
To commemorate the 121th birthday of Donald Healey, the Austin-Healey Club of America, Midwest Region, is sponsoring an event on Saturday, 1 day in advance of the British Car Festival. The starting point of the rally will be in the parking lot of the Tinsel Town USA Theater in North Aurora (just south of the Rt. 31 exit off Interstate 88). The Austin-Healey Club is proud to sponsor the D.M. Healey Rally starting at 12 Noon. The event will run as much as much as possible on non-congested back roads, and will wrap up at the newly re-opened Blackberry Inn, RT 47 and Main Street Road Elburn, IL 60119 (630)365-9740. Open to all British Cars & British Car Clubs! Late Registration (including day of the event) is $25.00 / $10.00 per additional vehicle. HOSTED BY: The Austin-Healey, Jaguar, Lotus, MG Car Club, MG T Register, Morris Minor, Rolls Royce, Sunbeam, Triumph, TVR, Rocky Mountain Vintage Racing and British Motorcycle Association clubs all take part in the planning and promotion of this annual event. COST: Before Sept 1, first vehicle is $25.00 and the 2nd vehicle is $15.00, after Sept 1, they are $30.00 and $20.00. The third vehicle is free. All British cars and motorcycles welcome. The purpose of the Colorado English Motoring Conclave is to further the operation, preservation and owner participation of the great British marques. The condition of your bike or car is not important! This is an event for ALL British vehicles, from beaters to everyday drivers to concours examples. All that counts is that you are a British vehicle nut like the rest of us! HOSTED BY: MGs of Baltimore, Ltd. Featuring British & European cars and motorcycles from classic to modern. In addition to the car show, the weekend’s events include food, silent auctions, raffles, drawings and the AITM awards presentation. Participants will receive a free event photo, dash plaque and Goody Bag with sponsor gifts and discount coupons to the Asheville Outlets stores. Autumn in the Mountains in Asheville means comfortable weather and beautiful fall colors. This is a great car show event! Held in conjunction with the Carlisle Harvest of the Arts Festival. Food, crafts, and entertainment. Artistry on Wheels is open to ALL British, North American, European and Asian Sports/Touring Cars. A Wild Card Class is included for repli-cars (i.e. Cobras…) and any vehicle that doesn’t fit the other classes or Global Regions. All 2018 1st Place Class & the 'Best of British' Founders Award winners will compete in a special class for the "Winners Circle Showdown". This award will be selected by the voting of all the Motorshow entrants. You must return with your 2018 winning vehicle to qualify for this special class. Check the line on the Registration form if that's you. COST: $20.00 Pre-registration only. This event is Pre-Registration ONLY. NO ‘Day Of’ Registrations are available! All registrations must be postmarked by August 31, 2019, NO Extensions. Show space is limited, so to reserve your space, submit your registration as soon as possible! REGISTRATION: Before 9/15-$15.00 After 9/15 - $20.00 Spectators are free. Come and enjoy a British car extravaganza and celebrate Octoberfest in the balmy warmth of autumn at the beach. A Friday night reception will be held at Nacho Hippo, and special guest hotel rates at DoubleTree Resort by Hilton Myrtle Beach Oceanfront have been arranged. Look for this event next year! Drive your Triumph on February 10th, to celebrate Sir John Black’s Birthday, the man who organized Standard’s purchase of Triumph after the war, and went on to make the cars we enjoy driving today. Step 1. Drive your Triumph on February 10. Step 2. EMAIL a high-resolution photo to driveyourtriumphday@gmail.com, along with some basic information: owner’s name, year and model of car, and place photo was taken (city, state, country).